Canadian agencies showed naiveté in dealing with China as it inserted itself into a Canada 150 project, says a Canada-China expert. Across the river from Parliament Hill, a free exhibit known as MosaïCanada 150 invites tourists to walk through gardens that depict Canadiana scenes — Anne of Green Gables, a Mountie on horseback, Canada scoring the winning goal against Russia in the 1972 Summit Series. Each province is represented, and there is a large garden illustrating Indigenous scenes. But amid the puffins representing Newfoundland, a man panning for gold nuggets, and ships from Jacques Cartier’s three trips to what would later become Canada, lie two monumental projects picturing Chinese iconic imagery — dancing dragons and celebration lions — sponsored by China. No other country is given such representation. One of the MosaïCanada 150 displays sponsored by China. China’s participation in the project comes as Canadian and Chinese officials engage in exploratory talks for a possible free trade agreement — a third round began this week in Beijing. 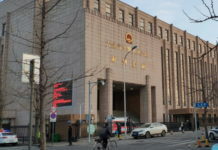 Public consultations, which concluded in June, have been criticized for glossing over the challenges of trading and relating to a suppressive regime. 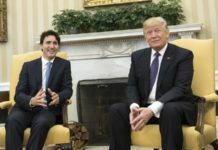 Canada’s new ambassador John McCallum plans to return to Canada every six to eight weeks to explain to Canadians why China-Canada relations are so important. And the Trudeau government is actively involved in a two-year project, bankrolled by major corporations, to change Canadian public opinion in favour of a free trade deal, according to The Globe and Mail. The Chinese have also kicked up their lobbying efforts. Four members of Parliament — Liberals Rob Oliphant, Pam Damoff, and Geng Tan, as well as Tory Michael Cooper — are in China on a trip sponsored by the Chinese People’s Institute of Foreign Affairs, a government-funded body. In an email, Oliphant, whose Toronto riding includes a growing Chinese population, said his was the first Canadian delegation, although the Institute funds about 15 trips a year for Americans. MosaïCanada 150 received millions in taxpayers’ funds: $5.2 million from Canadian Heritage, $2 million from Tourisme Québec and $2 million from the city of Gatineau. 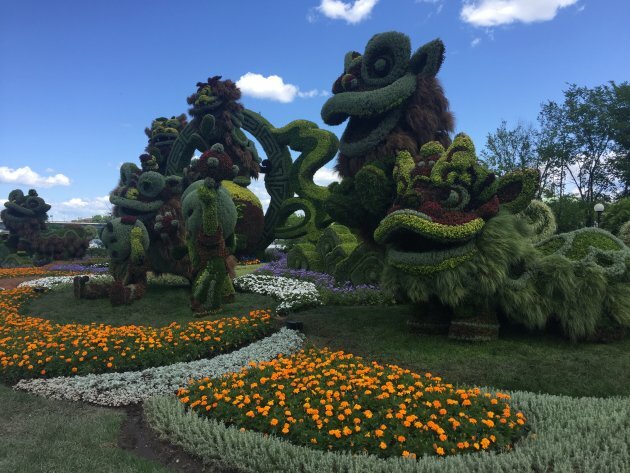 The spokesperson for the organizer, Mosaïcultures Internationales de Montréal, Kim Murray, said China had not paid to take part in the horticulture exhibit, but had offered its displays as a “gift” to Canada. “It was horticulturalists specialized in mosaicultures from Shanghai and Beijing who approached us. Because of their recent contribution to Canadian history and their affection for our country, they wanted to offer their mosaicultures to Canadians as a tribute,” she stated. “All the costs related to their works were defrayed by [China],” she added. The first Chinese scene features beautiful flower gardens and two hugely impressive dancing dragons underneath which snakes a red railroad, intended to represent the contribution of Chinese to the building of Canada. Under the heading “An excursion to China,” the information board says the work depicts elements of traditional Chinese culture and is offered for by the municipality of Beijing to celebrate Canada’s 150th birthday and the bond of friendship between the two countries. The second scene has no reference to Canada at all, featuring instead beautiful large lions and human-like creatures dancing. Murray initially told HuffPost Canada that no other country had approached the Mosaïcultures to participate; nor, she said, had organizers approached other countries to take part in the project. MosaïCanada 150 display of a Mountie. Several embassies, including the United States, France, and Britain, told HuffPost said they had not been invited to participate nor had they asked to take part in the project. Even the Japanese, well known for their florals, said they had been left out. 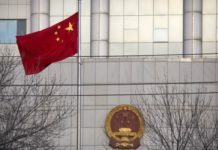 Zhao Haisheng, the minister-counsellor in the cultural section of the Chinese Embassy in Ottawa, also contradicted Mosaïcultures, saying it was the organization that had written to Shanghai asking the city to participate. 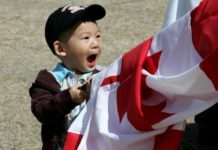 “To my knowledge, MosaïCanada approached China’s two biggest cities — Beijing and Shanghai — to see if they were interested in participating in Canada’s celebrations of its big birthday, 150 year anniversary,” he said. The founder of Mosaïcultures, Lise Cormier, knows China’s horticulture people very well, Zhao said. “So with the support of the Chinese government, especially the Shanghai and Beijing government, … we decided to donate two sites of horticulture pieces to Canada to Canadian people…. 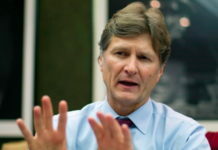 Burton, a former counsellor at the Canadian Embassy in Beijing, says China spends about $18 billion a year on public relations. “The regime knows that they have a severe image problem, one might say, because of reports of human rights abuse, and denying a critically ill Nobel prize laureate that they have imprisoned medical treatment, and their aggressive activities in the South China Sea, and the lack of co-operation on North Korea. Like, the news that you read about China is uniformly negative, so I think that this type of effort is designed to create a positive image of China to try to counter the highly negative image of China which exists in our media, and rightly so because of what the regime does,” he said. Burton suspects the horticulture exhibit is simply a normal public diplomacy project of the United Front Work Department, an organ of the Communist Party’s Central Committee, designed to counter the discourse about China that exists in the media. None of the agencies involved with the project seemed to have questioned themselves about China’s participation. The National Capital Commission, which donated the land on which the exhibition is held, refused to answer any questions about its internal deliberation. Senior media manager Jean Wolff referred all questions to Mosaïcultures. Gatineau’s spokesman, Yves Melanson, said he didn’t think anybody had made a notion of it, “much less frowned on the issue.” Mosaïcultures suggested the line-up and the received the funding for the line-up they proposed, he said. 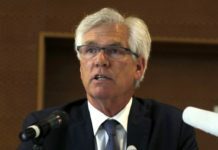 Melvin Jomphe, chief of staff for Gatineau Mayor Maxime Pedneaud-Jobin, said no one had raised any concerns about China’s participation in the project. “No question was raised about the choice of countries,” Jomphe said. There are strong ties, he added, between the horticulturists from Mosaïcultures and China. “Those relationships are several years old. This underscores the friendship between the MosaïCanada and teams from China,” Jomphe said. Initially, he said, there were preliminary discussions about having other countries participate, including China, and the city was open to that idea. 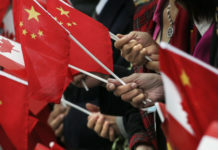 Tourisme Québec spokesman Jean Pierre D’Auteuil said no one raised any flags about China’s participation. When officials decided whether or not to contribute funding, D’Auteuil said, they were concerned only about the spill-off effects on tourism in the Outaouais region and in the province. Over at Heritage Minister Mélanie Joly’s office, bureaucrats declined to say whether anyone had raised concerns about China’s participation. Joly’s press secretary, Pierre-Olivier Herbert, said the minister was pleased with the great success of MosaïCanada 150 and that the department was “not involved in the day-to-day operations” of the project. A display of Canada’s 1972 Summit Series win.